Image of the active galaxy NGC1097, located in the constellation Formax. A new study finds that the last leg of this journey through the galaxy's inner region takes only about 200,000 years, much shorter than previously thought. The finding was presented last week at the 207th American Astronomical Society. Once the matter reaches the galactic center, it becomes fuel for the black hole and starting material for the formation of new stars. 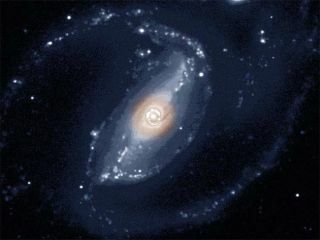 NGC1097 is a spiral galaxy located about 47 million light-years away in the southern constellation Fornax. Using the Hubble Space Telescope and the Gemini South Telescope in Chile, researchers were able to peer within 10 light-years of its galactic core--ten times closer than previous observations. "The resolution of this data is unprecedented," said Thaisa Storchi Bergmann from the Instituto de Fisica in Brazil who was involved in the study. "This paints an incredibly detailed picture of the region around the black hole and gives us a new glimpse at something we could only imagine before." By collecting spectral data at several thousand points near NGC1097's center, the researchers were also able to determine the velocity of gas streaming inward toward the galaxy's supermassive black hole. They concluded that it was moving at about 110,000 miles per hour and that it took about 200,000 years to travel 20 light-years, much faster than previous estimates. The finding could help solve the mystery of how supermassive black holes are able to transport the matter they need to sustain themselves from a galaxy's outer edges. Galaxies with supermassive black holes at their centers are known as "active" galaxies because they give off enormous amounts of energy in the form of radio jets, X-rays and other forms of radiation. Scientists estimate that feeding the activity of a supermassive black hole over its lifetime requires about a galaxy's worth of fuel. The spinning motion of spiral galaxies push matter inward towards their centers, but it was uncertain whether this motion was enough to keep pace with the black hole's appetite. Another problem was that the central regions of active galaxies are turbulent places where powerful gravity effects and energy radiation could impede the flow of matter needed to sustain the black hole. Kambiz Fathi, a postdoctoral researcher at the Rochester Institute of Technology who led the study said the new results helps put these worries to rest. "If we had measured lower velocities, you could argue that there is so much turbulence inside the galaxy that matter could never reach the center," he told SPACE.com. "But given that the velocities are very high, the turbulent nature of the [central] region can't stop it completely." The new finding could also help explain why the center of some active galaxies, including NGC1097, exhibit unusually high rates of star formation, a phenomenon that astronomers call "starburst." Like supermassive black holes, young stars require lots of starting material to form and it has been unclear how matter was reaching those stars deep inside a galaxy. One hypothesis was that the supermassive black holes in these galaxies were causing starbursts by creating dense regions of matter around themselves which the growing stars could draw upon. The new results suggest another possibility, however. It may be that the rapid influx of matter is feeding the black holes and the growing stars. "We believe it's due to this effect that the enhanced star formation can happen," Fathi said. "There's an overabundance of gas and something has to happen to the gas, so part of this gas forms more stars in the center."